Following on from our image of the month of the medieval carving of St George and the dragon now housed in the Chapel Archives, our next St George in this series is a near replica of that very same carving. 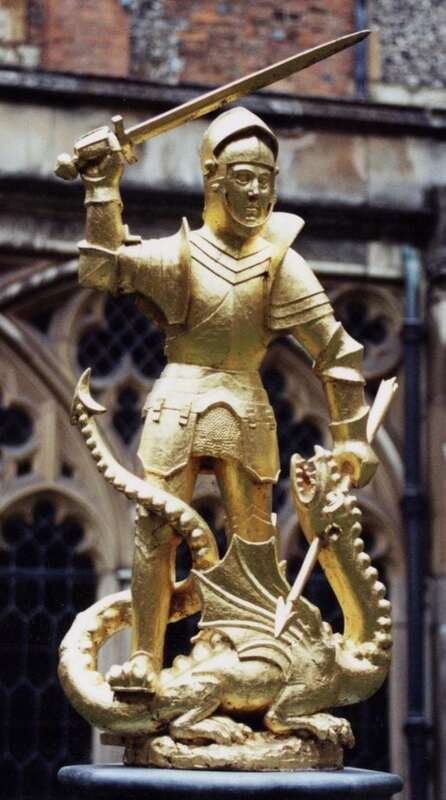 The figure stands atop a lead fountain installed in the Dean’s Cloister in 1998 to celebrate the 650th anniversary of the founding of the College of St George and the Military Knights of Windsor. The grassy area within the Dean’s Cloister, known as the garth, was formed in the time of Henry III and it is apparent from historical plans that it was divided into four sections by paths in the early 17th century. There was also some form of water cistern in the area. However, by the nineteenth century it appears that there was just grass in the garth. Towards the end of the twentieth century it was decided to combine a desire expressed by many to improve the aesthetics of the Dean’s Cloister with the 650th Anniversary of the College. After some discussions, the design of a central fountain linked to the cloisters by four paths forming a cross of St George was decided upon. The lead cistern of the fountain is octagonal and incorporates a quatrefoil design that mimics the cloister arches. The figure of St George and the dragon is largely cast from the medieval carving. However, this knight in shining armour does feature some differences. As the sculpture can be seen very clearly from all sides, the sculptor was able to use some artistic licence to add details to the back which are lacking in the wooden carving, including adding a second wing to the dragon. The new fountain was officially unveiled on 17th June 1998 by HM The Queen and HRH The Duke of Edinburgh. The sight of St George glinting in the sun certainly brightens up this part of the College.